Brennen Beyer, who played linebacker as a freshman last season at Michigan, has been moved to weak-side defensive end for spring practice, which started Saturday. The opening of the Michigan football team's spring camp Saturday was the official debut for several players at their new positions on the offensive and defensive lines. Most of the moves involve linemen sliding to new spots. Brennen Beyer, though, is switching position groups entirely and could have the steepest learning curve of them all. Beyer had a strong freshman campaign last year at strong-side linebacker, but he has since moved to weak-side defensive end. The coaches were pleased with Beyer at linebacker, but their hand was forced by the departure of starting linemen Mike Martin, Will Heininger and Ryan Van Bergen. Beyer is expected to compete with sophomore Frank Clark for the starting job in camp. Players say he could win the spot, if he can adjust to the speed of the game up front. "Everything happens a lot faster on D-line," Martin said recently. "That's going to be a challenge for him, at least until he becomes more instinctual, and less dependent on responding to the offense." Martin said Beyer is well-suited for defensive end because he is physical at the point of attack, but will need to work on his hand work. "It’s about hand placement (at defensive end) and knocking guys back, because that’s what (defensive coordinator Greg) Mattison wants our ends to do," Martin said. "Pushing guys back and creating a new line of scrimmage, and when you’re lined up over a tight end, really forcing teams to not be able to run it where they want to run." One guy who has an interesting perspective on Beyer's move is Steve Watson, who as a junior made the same outside linebacker-to-defensive end move that now awaits Beyer. As a senior, Watson played tight end, where he often lined up across from Beyer in practices. So, he has a good feel for Beyer's game, and the challenges he will face this season. "He’s great at getting off blocks," Watson said of matching up against Beyer. "That’s one thing I remember about blocking him that was difficult — that he has really long arms and he’s very good at using his hands. He’s good at shedding people." Watson said one thing that will help Beyer's transition is he is coming from outside linebacker and not middle linebacker. In Mattison's 4-3 scheme, the outside linebackers and defensive ends work in tandem, so Beyer already has a good feel for what will be expected of him. "Now, if you were to say (middle linebacker) Kenny Demens was going to go play weak-side defensive end, OK, I might say he’d struggle a little bit," Watson said. "But the fact is, guys are switching sides, and outside linebackers moving up isn't going to be a huge deal." 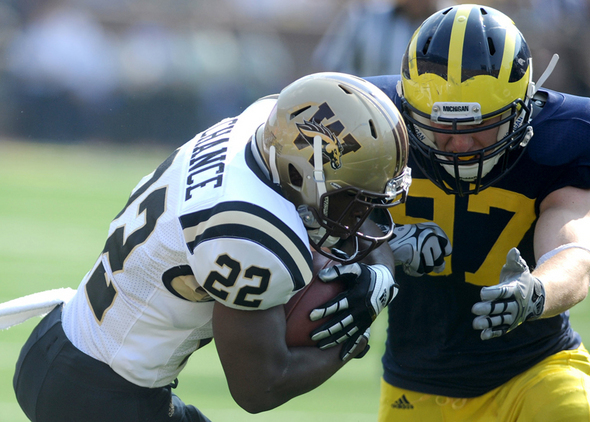 Michigan's old weak-side defensive end, Craig Roh, has moved to strong-side defensive end. Watson said the game changes by flipping sides of the line, but not much. "I think he’ll do fine with it, because he’s so used to moving," Watson said of Roh, who began his career as a linebacker. "I don’t think it really matters (that he's moving again), because the strong-side and the weak-side end is the same thing." On offense, the big move of camp involves Ricky Barnum, who is sliding from guard to center and will be given the first shot at replacing David Molk. Molk said the game changes significantly when moving to center. "You're responsible for so much more," Molk said recently. "You got that ball starting with you, you have the exchange (with the quarterback), the blocking assignments change. It's not like going from tackle to guard, or guard to tackle. (Center) is a totally different position." Michigan coach Brady Hoke told reporters on Friday that Barnum's education at center began last season, which should give the redshirt senior a much-needed boost heading into the season. "We did quite a bit with Ricky when he got back healthy last year, playing both," Hoke said. "I think (offensive line coach) Darrell (Funk) and (offensive coordinator) Al (Borges) both had that mind-set, if we did get beat up somewhere else, where we had to rotate those guys. Sun, Mar 18, 2012 : 5:39 p.m. Thanks for the insight. Bottom line: Brady Hoke wants to win and he's gotten to know his roster much better after one full season and he can now make assessments and judgements on what personal can be more effective and prosper under new roles. Translation: Hoke will find more ways to win. The team will benefit and Michigan will win more football games in the process. Apparently, there's lot going on behind the scenes and you gotta be encouraged. Sun, Mar 18, 2012 : 5:04 p.m. Interesting article. Michigan shouldn't surprise anyone with their vast history, but these O and D lines will put the opposition on their faces and backs, with embarrassment. Michigan has always been known for blocking and defense and this year will be no exception. Trust Hoke and staff the fill all the holes, with all the right men and all the right results. MgoBlueForTiM.....opposing players taking home our turf in their helmets and pads. Sun, Mar 18, 2012 : 4:09 p.m. Very interesting article. it's interesting to see how Michigan is sliding linebackers to DE and DE to DT in hopes of making up for the loss of Martin, Van Bergen and less so Heininger. It would be nice to see one of the 2012 DT recruits Pipkins, Godin, or Henry develop quickly. The only area we were far behind Michigan State in was DL. Worthy was dominate and Gholston is an absolute beast. He's like a deranged Reggie White. Mon, Mar 19, 2012 : 12:03 a.m. Unfortunately, it will take us a little while for our O-line to gel. Speaking of msu, I seem to recall their run game struggled in the first half of the season due to several new players having to learn how to play with one another. Timing and blocking schemes are everything. We may not be &quot;far behind&quot; on the DL, but at this point, we're not exactly equal either. I like how you termed &quot;were far behind&quot;, as in thing of the past - which it was. This year vs state they will stand out for their green, but as grass stuffed up their helmets and pads from biting the turf every play. Sun, Mar 18, 2012 : 3:01 p.m.